Posted on Tue, Feb 28, 2012 : 1:56 p.m.
One of the nine roundabouts in Washtenaw County. 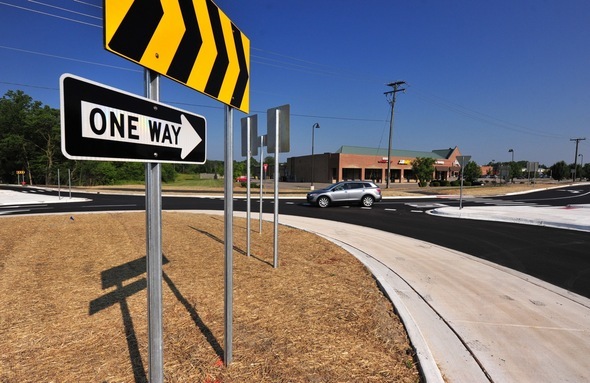 If you have questions about the proposed roundabout planned for State and Ellsworth roads in Pittsfield Township near the Costco site, stop by the public information meeting at Pittsfield Township Hall Wednesday evening. The meeting is scheduled to begin at 6:30 at 6201 W. Michigan Ave., and representatives from both the Washtenaw County Road Commission and its consultant for the project, DLZ Michigan, Inc. are expected to attend. This would mark the 10th roundabout in the county. According to Road Commission officials, here at the locations of the other roundabouts in the county. There will be a discussion of the layout of the roundabout and residents can ask questions. This project is scheduled for 2013 and another forum is planned as more details are finalized. Thu, Mar 1, 2012 : 12:01 p.m. I attended this meeting last night along with about 80 to 100 other residents. Most of the comments from the people attending this meeting were against truning this intersection into a round about. This is not a PROPOSED round about it will happen spring/summer 2013. There is federal money and money from Costco funding it. Like the &quot;Feild of Dreams&quot; movies, if you build it we will have to drive through it. Thu, Mar 1, 2012 : 1:03 a.m.
Lisa, You call something at East Ann Street and Observatory a &quot;roundabout&quot;. I remember a sign there calling it a &quot;traffic circle.&quot; There's also a traffic circle at Yost and Oakwood Streets. Traffic in both areas move much more slowly than at roundabouts. Wed, Feb 29, 2012 : 4:18 p.m. This is an excellent place for a roundabout. Most of the traffic through that intersection turns one way or another, and the extensive backups are mostly due to the long red-light times needed to let all of those different turns through one crossing. I think most people will be shocked how much that would clear backups without adding extra lanes. Wed, Feb 29, 2012 : 2:15 p.m. The roundabouts they built in this area are way too small! The traffic must drive so slowly through them that they amount to nothing more than 4-way stops. Unless they take out the businesses on the corner of State and Ellsworth, there is not enough room to construct a properly sized roundabout. I agree with those who say this will not ease congestion. If roundabouts were the answer to traffic congestion, why not put one in at the Jackson / Maple or Washtenaw / Carpenter intersections? No, the answer to traffic congestion is a bridge. They figured this out in Wayne County. Take a look at 8 Mile and Telegraph, or Michigan and Telegraph. Thu, Mar 1, 2012 : 12:49 a.m. I know how it can take 5 traffic-light cycles to get onto northbound Maple from eastbound Jackson, or how long a wait it is just for one traffic-light cycle for turning from northbound Carpenter to westbound Washtenaw. I bypass both of them, using Wagner Road or Brandywine instead. Thu, Mar 1, 2012 : 12:44 a.m. I think I know where that Telegraph Road bridge is, between Ecorse Road in Taylor and the city of Dearborn. What you call &quot;Michigan and Telegraph&quot;. I know Michigan Avenue runs through southern Dearborn. Wed, Feb 29, 2012 : 1:52 p.m. So, there is no money to fix our gravel roads, or Saline-Ann Arbor road, or Carpenter between Packard &amp; Washtenaw, or Austin road, or to remove dead trees but there is money available for NEW projects? Needed or not is a nice debate although you will find the decision has already been made. The real issue is how money can be found to do NEW projects yet none available for what already exists. Wed, Feb 29, 2012 : 12:09 p.m. I go through there at least 4 times a day morning, afternoon and evening. People cross the street there. A much better idea would be to make Ellsworth 5 lanes from Lohr Rd to Platt. Wed, Feb 29, 2012 : 3:35 a.m.
Also, I've noticed the road commission is slowly gaining confidence on higher and higher traffic intersections---leading up to what I hope will be the Washtenaw/Carpenter/US23 parking lot? Bring it on! Wed, Feb 29, 2012 : 3:17 a.m. If the city is going to continue to build roundabouts I hope they show a little more in the way of smarts in the lighting! The roundabout at maple and M-14 has 4 light poles broken off right now. It does not take a genius to figure out that the light should be on the INSIDE of the circle! That way when the cars slide off the icy road they cannot hit the poles! Wed, Feb 29, 2012 : 2:21 a.m. Yawn. The north-siders complained when they put the roundabouts in at Maple - then they got used to it. (Only problem - the area needs better lighting for the students.) Then, the east-siders complained when they put the roundabouts in at Geddes - then they got used to it, and grew to love it when the traffic jams went away. Now, the south-siders are complaining about a roundabout at State/Ellsworth--how much do you want to bet they'll get used to it a year after it's in, and the traffic jams go away? I'm all for them. Ann Arbor can't manage to time their lights so every traffic light means 2-3 minutes of delay that add up. I'll take a no-red-light roundabout anyday. Incidentally, I've grown to like the Lee Rd. roundabouts as a great place to get gas or McDonalds without waiting at red lights. Granted, they're way more complicated than they need to be (or should be), but once you figure them out they're not bad. And State/Ellsworth will be nowhere near as complicated as the Lee Rd. behemoth. Wed, Feb 29, 2012 : 1:39 a.m. The round about at US-23 and Geddes works great (when folks are paying attention ). Rush hour traffic was up beyond the college when there was a traffic signal there. Thu, Mar 1, 2012 : 12:04 p.m.
that's the issue I have with round abouts folks don't pay attention or just don't know how to drive through one. Wed, Feb 29, 2012 : 1:14 a.m. I have read all the pro and cons to everyone's position on Roundabouts. Has any commenter's lived near one of the roundabouts? I did for the first year after whittaker road opened. It was impossible at times to exit my driveway. The biggest issue with the roundabouts is where the control of the roundabout happens. Whittaker road is the North or south bound traffic during the evening commute. You can sit on Stony creek for a good minute waiting for traffic to slow and get in the roundabout. Lee road is any traffic from the east side of the bridge (east of US23). Geddes and US23, southbound exit, you can sit on the North bound exit for minutes waiting for an opening. The major traffic flow causes the roundabout to be a one-way traffic flow. Drivers don't yield like they should to make sure traffic is not going into their lane of travel. This is not how roundabouts help traffic flow Roundabout as people have said &quot;works best in lower traffic counts&quot;. In spots that have 4 way or odd connections it helps move traffic, but seriously, State and Ellsworth. How about a Michigan left with a dedicated left turn lane from State? AA.com, What are the other options that have been purposed for this intersection? If the roundabout is placed at State and Ellsworth, you will see more gridlock than you see last year in Washington DC. Wed, Feb 29, 2012 : 1:13 a.m. The roundabout is a great idea, especially for handling high traffic. I've driven in cities with roundabouts that handled twice as much (if not a lot more) traffic. They work and they move traffic - safely. It's about time that Michigan joined the rest of the world with efficient traffic engineering. Four-way traffic light intersections with left turn signals and all are the equivelant of horse carts in an internal combustion engine world. It is time to get creative with how we manage traffic and this is a good start. With regards to pedestrian crosswalks (reference to an earlier comment), the area around that intersection is not one that tends to attract pedestrians, and lets be realistic, is not likely to in the future. Wed, Feb 29, 2012 : 2:58 p.m. The Social Security offices have been moved to Research Park Dr and there is a charter school for K-8. Crossing Ellsworth is the way to catch the out bound bus. Exactly how do you propose they get across to do that? It is already risky business. @AAW - they have been looking at ways to aleviate the traffic on Ellsworth for years. The land is occupied and they cannot widen the road. Thay also moved the city's truck/car depot to Stone School and Ellsworth a few years ago. This has helped to create, not eliminate more traffic issues. I remember reading that the conclusion on the traffic study for that said the traffic situation is alread an E, it cannot get any worse. I am not sure how often you drive through that intersection, but there is a bus stop at Speedway. I go through there at least 4 times a day morning, afternoon and evening. People cross the street there. A much better idea would be to make Ellsworth 5 lanes from Lohr Rd to Platt. Wed, Feb 29, 2012 : 12:29 a.m.
Tue, Feb 28, 2012 : 11:27 p.m. I like how these types of community forums are scheduled AFTER these things are already a done deal. I hate roundabouts -- and I have avoided going to the Brighton Costco specifically because of those insane double roundabouts. What I now do is get off an exit earlier and take the access road to the Costco rather than the highway exit. Are there fewer accidents? Maybe -- its because NOBODY knows how to navigate them, and everyone slows down so they don't run into each other...and keep a better eye on the oblivious old folks like my dad who drive right through them without regard to ANYBODY else and the traffic flow.... Bad Bad Idea....but we have no say anyway. What use is a community forum? Tue, Feb 28, 2012 : 11:07 p.m. The majority of comments clearly show that people do not understand that roundabouts are a much safer and efficient way to move large numbers of cars through an intersection than 90 degree angle traffic lighted intersections. It would behoove Ann Arbor city administrators to initiate a public education campaign to teach residents how roundabouts work. In the mean time, I encourage any commentators who want to learn how roundabout work to view any of the readily available videos on YouTube that address this topic. Tue, Feb 28, 2012 : 9:26 p.m. So many misconceptions.... The modern roundabout is very different than the large rotaries and traffic circles that you find in the northeast and Europe. Their small size (tight radius) is a safety feature, since it forces people to slow down. The deflection on entry helps do that as well. They can also be incredibly efficient at moving traffic through them. This article describes Wisconsin's experience with them: <a href="http://host.madison.com/wsj/news/opinion/editorial/loopy-roundabouts-actually-work/article_bf45d852-538f-11e1-81cb-0019bb2963f4.html" rel='nofollow'>http://host.madison.com/wsj/news/opinion/editorial/loopy-roundabouts-actually-work/article_bf45d852-538f-11e1-81cb-0019bb2963f4.html</a> The biggest obstacle tends to be fear, however. Thu, Mar 1, 2012 : 12:08 p.m.
aamom There is not enough money from the three governments involved to buy the land need to make it bigger. That was stated last night at the meeting. Plus according to the people giving the information at the meeting bigger doesn't mean better. Tue, Feb 28, 2012 : 11:28 p.m. I would say the biggest obstacle is that people hate them so much they look for alternative traffic routes, jamming up back/service entrances to shopping centers, and wrecking havoc on side streets. Tue, Feb 28, 2012 : 9:43 p.m.
&quot;They're more efficient because drivers don't have to stop for long red lights (assuming the diameter of the roundabout is big enough to handle its traffic volume).&quot; This is taken out of the article you link to. I don't think there is enough land there to create a large enough diameter to handle the huge traffic volume at rush hour. Smaller roundabouts might be safer overall, but sometimes that has to be tempered with the reality check that this isn't an intersection prone to many accidents at all, let alone with fatalities. Tue, Feb 28, 2012 : 9:24 p.m.
Tue, Feb 28, 2012 : 9:18 p.m.
Tue, Feb 28, 2012 : 9:14 p.m. There are roundabouts in SE Michigan that handle far more traffic than you'll ever see at this intersection. A roundabout is moves more traffic with better safety and efficiency than a signalized intersection. Thu, Mar 1, 2012 : 12:10 p.m. Size doesn't matter with the round about. It is traffic on Ellsworth and State that already back up with the other lights on these roads, or when I-94 has an issue. Thu, Mar 1, 2012 : 12:47 a.m.
Van Dyke and 18 1/2 Mile Road is a high volume roundabout. There are several in the Farmington Hills and West Bloomfield area too. All handle lots of traffic without a problem. Wed, Feb 29, 2012 : 2:47 p.m.
You try to make a left off Research Park Dr onto eastbound Ellsworth at 5:00 and see how long it takes with a light. Ellsworth is not equipped to handle the amount of traffic or the flow they are trying to create. They will have to put round-abouts all the way to Carpenter. Tue, Feb 28, 2012 : 9:38 p.m.
Where? Also, I thought most of the roundabouts that move a lot of traffic are like the really big ones you see over in Europe. There isn't enough land there to make a large traffic circle. Tue, Feb 28, 2012 : 9:12 p.m. I whole heartedly agree with all the comments that mention why a roundabout is such a poor choice for this intersection. I hope you will all be able to join me in attending the meeting tomorrow night to voice this to the County and the designers since they obviously don't understand how traffic works on a day to day basis. I would also be interested if they would be willing to be some of the first pedestrians to attempt to cross through the mass of traffic that will be flowing through this thing if it gets built. Wed, Feb 29, 2012 : 2:40 p.m. I agree with the pedestrians, there are bus stops along this route and people have to get to the other side of the road to catch it. They are risking life and limb with the lights, remove them and it is certain death (remember frogger). Are they going to put in a raised sidewalk for them to cross both State and Ellsworth? I have seen traffic back-up from Platt to State on Ellsworth and not just when there is an accident. They are also doing construction on Packard from Platt to US23 this summer, alternative route - Ellsworth. Tue, Feb 28, 2012 : 11:29 p.m.
@ John Q-I drive through this intersection twice a day five days a week during rush hour so pretty sure I realize just how much traffic there is and realize how often back-ups occur and what direction they are in. @Jon S-I fully understand that roundabouts move traffic more efficiently than a standard intersection and certainly reduces gas consumption, but that is not the case when traffic backs up to that roundabout due to a nearby traffic signal that is less efficient, i.e. when traffic backs up from Varsity on Ellsworth all the way to State which unfortunately happens more often than it should. Tue, Feb 28, 2012 : 11:10 p.m.
Actually, there is plenty of data that shows the exact opposite - intersections with roundabouts save time by keeping the traffic flow moving and moving cars mean cars are not sitting at a traffic light, idling and wasting gas. Tue, Feb 28, 2012 : 9:15 p.m.
Are you a traffic engineer? Please share with us your traffic counts showing us how this intersection functions on a daily basis. Tue, Feb 28, 2012 : 9:04 p.m. I don't know how many of you are in the area during rush, but State backs up about 1/2 mile towards Textile in the afternoon and in the morning it backs up over I94. To put in a round-about is a bad idea. The traffic is just too heavy. Not to mention that most American drivers do not know how to handle them. What about Research Park Dr? Are they then going to remove the ability to exit and the light? That will cause issues with the round-about flow if not removed. How will those who work on Research (or other business parks in the area) get onto State (north or southbound), Ellsworth (eastbound) or I94? If the flow doesn't stop that gives those individuals no chance to exit the business parks. Ellsworth is at a standstill everyday at end of day rush. How will the new round about fix that? If traffic is already not moving exactly how is taking out a light going to ease congestion and keep things moving? I have been driving this route for the last 20+ years. I was going down Ellsworth when there were no stop signs or traffic lights between State and Platt. Now the traffic is so horrific that they need to widen a road that has no room for this. Unless they alleviate the traffic there it is going to be a bigger mess then it already is. Wed, Feb 29, 2012 : 4:25 p.m.
Widening the road would not help, even if they have room: Most of the backups at this intersection are because of extensive turn traffic, and gridlock between those trying to go left, straight and right at different times from two lanes that move together. That's why a roundabout here would be a *good* idea: Keep the traffic moving regardless of the direction it wants to go. The &quot;American drivers don't know how to handle them&quot; argument basically means never change. I remember that argument used against right-turn-on-red too. The American drivers learned. Couldn't agree more. I'd be willing to bet that the County doesn't even realize how frequently that Ellsworth backs up from Varsity all the way to State Street. Or the mayhem that occurs when I-94 is closed due to an accident, or when State Street was closed a month ago due to that water main break. The county would of course argue that these are such rare accounts, but I'm sure those rare accounts would turn into nightmares when they do happen. I'm also curious what will happen if there is still large scale congestion and then how a fire truck from the fire station just down the street is suppose to get through all of traffic. Tue, Feb 28, 2012 : 8:55 p.m.
Oh, and make sure the traffic study accounts for every other driver either talking on a phone or reading a text. Tue, Feb 28, 2012 : 8:45 p.m. I agree, and I'm very disappointed that they are planning on doing this at the new Costco. I am accustomed to driving in roundabouts, but I avoid the Brighton Costco/Lee Road area like the plague because of that ridiculous mess they've got. It's probably a good thing for me because I'll end up spending less there, but these businesses should realize that this could cost them customers. The amount of traffic headed North and East at five o'clock will back cars up to Textile and the Liberty Street. The merging of nortbound and southbound traffic going east will be a regular bump and spin. I would love to see the volume study and animation of the traffic flow at rush hour. Tue, Feb 28, 2012 : 8:29 p.m.
What a disaster. Just ask the people who try to navigate the roundabouts up near the Brighton COSTCO. this is another mediocre idea forced on thhe public by myopic minds. Thu, Mar 1, 2012 : 12:35 a.m. This roundabout will not be as multi-lane as the US-23 Lee Road roundabouts are. A two-lane roundabout will have YIELD painted in white right before the roundabout begins. The rules for yielding the right-of-way apply to roundabouts, like at any four-way stop, except that if there's no one for you to yield the right-of-way to, you don't have to stop at all. At an intersection with a roundabout, NOBODY can speed through it. Tue, Feb 28, 2012 : 11:08 p.m.
Actually, roundabouts are much safer and efficient than traffic lighted, 90 degree angle intersections. I agree man. Roundabouts are a bad, kindergarten idea. Besides, America is losing the concept of being straight-forward. Roundabouts are an example of this. Tue, Feb 28, 2012 : 8:23 p.m.
Tue, Feb 28, 2012 : 7:54 p.m. I think this is a brilliant idea; I really hate waiting for red lights and stop signs when there isn't anyone else around. I will save gas as well since I will not have to sit there and idle waiting for the light to change. Tue, Feb 28, 2012 : 7:25 p.m.
Why not the junction further south, at Textile and State? That one often has people waiting at the light with no one else around. Tue, Feb 28, 2012 : 7:23 p.m. I think it is a bad idea to put a roundabout at that location. The intersection is way too busy for a roundabout - most of the other roundabouts are located at intersections with less traffic. Wed, Feb 29, 2012 : 2:13 p.m. The US 23 southbound Geddes Rd exit used to be a nightmare for those hoping to turn left at the light. Now traffic flows smoothly thanks to roundabouts. The only backup is when someone unfamiliar with the concept STOPS at the yield sign while entering a roundabout when no traffic is coming. That's the point of a roundabout. It keeps the traffic moving. Really? They're going to put in a roundabout after the Costco opens? Why hassle the travel to a highly desired destination with road constriction? Given not too much more time the road surface will deteriorate and will need to be replaced anyway. If they can't get it in before Costco opens, then wait until it's needed.